Disclaimer: This was a trip taken in 2011 and was written in the same year. Rates and charges might have changed since. For a someone who hadn't travelled very much in her childhood, Delhi beckoned to me from everywhere - from cheap, registration-challenged-blurry postcards, school textbooks, backdrops of technicolor movies, stamps - you name it! Delhi called me from everywhere. The Red Fort, the India Gate, Qutub Minar - they held me in some powerful, unwavering spell through the years. And it didn't help matters that my parents had an album full of beautiful photos clicked during a brief stopover at Delhi - without me in the picture, literally. So when I finally boarded my flight to Delhi, I was all quivers. After all this while, finally - Delhi. We landed at the much talked about T3. I'd heard both horror stories and breathless raves about the place. This is a good two years ago, when the novelty was still brand new. All I cared was that my bag took its time to make an appearance. I don't really like it when my bag takes it time to make an appearance. But eventually, it did come. We stepped out and the bright Delhi sunlight blinded us momentarily. We looked around, blinking at the sheer enormity and unfamiliarity of the place. A friend was going to pick us up and give us a ride to my sister's place. But, lunch first. All through the ride to his place, I had my face plastered on the glass of the window. Drinking Delhi in. Delhi's notoriety did nothing to wane my fascination with the place. The city is such a mix. From dusty roads with careening traffic throwing up dust to bustling streets where brand new enterprise rubbed shoulders and elbows with commercial remnants from the last few centuries. Around road bends, under treed boulevards, TV crew stood recording some news tidbit - this was the capital after all and there was so much to report. For me, the tourist, I chose to associate with the ghosts of all that's been. And that's all that stayed with me. That lingering past that teeters at edge of progress's callous mouth - afraid, yet precariously resigned to being eaten away by time. The ancients had an air of constantly holding their breath. But that was not the case with the India Gate. In the dying sun, it stood resolute and tall in its salute to all that is valorous. Made of red sandstone, the 42-metre structure dominates the horizon and stands like a prelude to the Rajpath Avenue, shoulders spread. A mark of pride. This memorial that pays tribute to the British and English soldiers martyred during the World War 1 and the third Afghan War in 1919 was designed by Edwin Landseer Lutyens. As I went closer to this unbelievable imposing structure, I realised that there were names inscribed upon it - all 13,516 of those who fell, trying to defend the honour of the British Empire. 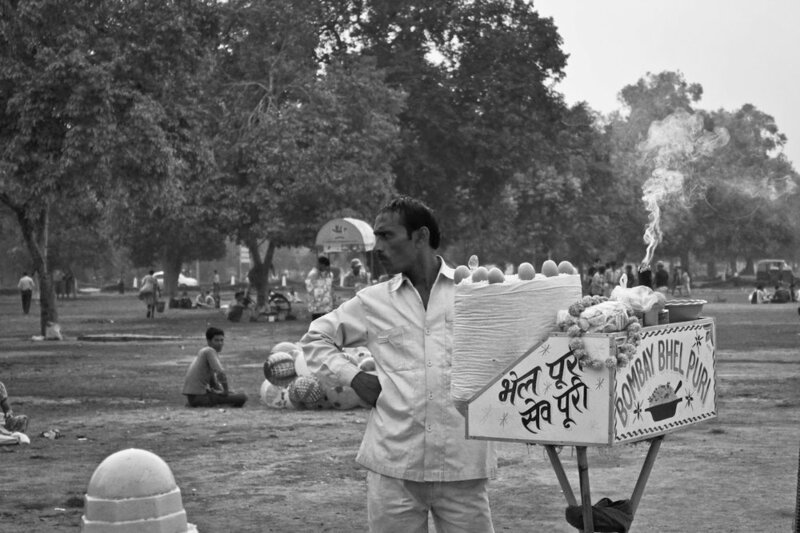 The chaat stalls and the gypsy women hawking and pushing alphabet beads and chains are an odd contrast against the Amar Jawan Jyoti or the Flame of the Immortal Warrior. This eternal flame is homage to the soldiers that returned from the Indo Pak War, 1971. A black marble cenotaph has a rifle placed on its barrel, holding up a soldier's helmet. It's hard not to be touched by the fact that all that we take for granted could be compromised in a twinkling, and that people who don't know us or of our existence, actually died protecting us. And then you turn towards the west, and you're shaken out of your sentimental reverie. A little rudely, so! Rajpath Avenue, as gorgeous as it is, brings to mind our country's biggest malady - corruption. It's almost travesty that such beauty should hold such blatant wrong. But who am I to judge. I'm here for the scenery. And the scenery is beautiful. The dying October sunset washes the sandstone of Lutyen's Delhi in an ethereal glamour of chrome reds and dusty pinks. We drove past offices that looked like royal chambers, built with Mughal and British architectural influences. The Parliament House waved a familiar hand from across the road as we whizzed by this no-nonsense place, where the average citizen must mind his Ps and Qs. In these parts, nonsense is the sole prerogative of the great netas of our country. Everything on this road exudes power, a strange smell of old world and nouveau arrogance hovers - making you unconsciously cower into your self. But that's Delhi for you. As the seat of power across ages, she holds herself erect and proud like a powerful emperor's favourite wife. She's aware that time takes off its shoes when it steps into her chambers. She knows of all the blood that has seeped into her pores, and she smiles a grim smile of satisfaction over the knowledge. She's a little cruel. Nay not a little, but extremely. She knows of the ghosts that stand resolute at the ramparts of the fallen city, refusing to give up, in the afterlife, what they had when their mortality failed them. She knows of the price they pay for their restless vigil as they haunt what belonged to them, and she isn't touched. The grass will be clipped and callous tourists will drop the occasional plastic bottle. She doesn't care. She's immovably, Delhi. It was well after dark when we reached my sister's place in Lajpat. A place that tries to get amicable with the stand-offish, very posh Defence Colony. My sister lived with a dear old lady we all called Daadi. A dyed-in-wool Punjabi, Daadi insisted on calling my sister Alka. "Alexina" as my sister was christened by my parents, must have proved to be too much of a mouthful and in true survivor spirit, she found a way around the problem - another, much familiar name. Daadi, like many of her contemporaries, is a survivor of the partition. Her austere living quarters mocked at the prosperous life she allegedly left behind in Pakistan. Mostly lonely, Daadi lost wealth, family and property amongst many intangible things. The partition rewrote the destiny of North India in blood and Daadi's was no different. But today, she's a lovely old, talkative woman who's fiercely independent and loves her mitai. The next morning we decided we would head for Red Fort. In Delhi, days ought to begin early. The sun can get extremely cruel and so can the crowds. We got dressed and walked down to the metro. I was floored by the Delhi Metro. You could travel to just about any part of the city without having to part with a large portion of your salary. And that's saying a lot for someone who lives in Bangalore. (This was before Bangalore hopped on the Metro bandwagon) We were headed for Red Fort or Lal Quila, which is in Old Delhi, where the sprawling roads meander into little gullys of questionable intention, and secrets beckon enticingly. You need to watch your step in Delhi. There is something predatory in the air - several centuries worth of rulers and riff-raff will vouch for the wisdom of that piece of advice. Delhi is believed to be the site of legendary Indraprastha where the Pandavas ruled supreme in the epic Mahabharata. Believed to be over 5000 years old, this city has played host to one covetous dynasty after the other. India couldn't have had a more fitting capital. Delhi's history is a tapestry of legend and fact. As the legend goes, Raja Dhilu founded Dilli in 100 BC, though fact has it that the Tomar Rajput rulers began building this city in AD 736. In 1180, the Chauhans captured the city and established Qila Rai Pithora, which has gone down in history as the first city of Delhi. In 1192, Muhammad Ghori captured Delhi in the Second Battle of Tarain. In 1206, on his assassination by disputed parties, his kingdom was divided amongst his Turkic slaves whom he regarded as his sons. Qutub-ud-din Aibak took over Delhi and began the Sultanate of Delhi, also known as the Slave Dynasty. The Mamluk Dynasty is best remembered by the Qutub Minar and the fact that it was ruled by one of the few female monarchs in Indian history. Sultan Razia is perhaps the only Muslim to have graced the throne of Delhi. The Khiljis followed the Mamluks, who were in turn followed by the Tuglaqs, the the Sayyid Dynasty and then finally the Afghan Lodi Dynasty. It was in 1526 the Mughal rule began in India with Babur overthrowing Ibrahim Lodi - and reigned supreme till 1856. And Red Fort stands tall, as it did in 1648, when the Delhi became the Mughal capital once again as Shahjahanbad, as if waiting for the thunder of hooves and resounding trumpets that announced His Majesty's arrival. Shahjahan, Akbar's grandson and Humayun's great grandson is considered one of the greatest Mughals and his reign is considered as the Golden Age, especially as far as architecture is concerned. The imposing Lahori Gate leads to the covered bazaar or the Chhata Chowk. Today it holds a melange of mostly overpriced souvenirs. But back in the day, this was where the women of the palace would come to shop. Traders would leave their wares open for inspection and step back. The women would choose what they liked and would leave the money behind. A walk past gardens where peacocks once strutted, we came upon the Naubat Khana, or the elephant gate, whereupon visitor would disembark from their elephants. It's hard not to feel a little intimidated by the palace with its marbled hallways and echoes that fade into a shudder. At the Diwan-i-Aam, where the emperor sat in a jewelled alcove, listening to the complaints of the common people, we were in the company of a sizable crowd. The grounds of the Red Fort as vast and each building within it, has its own story to tell. Immediately to the east of the Hall of Public Audiences is the Rang Mahal, the chambers of the Sultan's wives and concubines. The northern side of the Rang Mahal is occupied by the Khas Mahal which used to be the personal palace of the emperor and the third building in this row is the Diwan-i-Khas, the Hall of Private Audiences - an exquisite place that still stands out from the rest of the pavilions. The legendary Peacock Throne used to grace these halls before it was taken as part of the plunder by Nadir Shah in 1738. These palaces overlook gardens where once lions and tigers and elephants fought each other to the bloody finish to amuse a royal audience. Whatever the fuss that went around it, the Moti Masjid where Aurangazeb had his private trysts with God, with its pearl like sheen, sits with the same equanimity as it has had for centuries. The appearance of very English military barracks within the fort came upon us like a rude shock, but historical evidence shows that many beautiful chambers were knocked down in order to accommodate the British Army when it occupied the fort in 1857. At the far corner of the fort grounds, Mumtaz Mahal sits like a maiden taking a breather under the shade of the trees. The palace of Shahjahan's favourite wife, for whom he built the Taj Mahal (most of us get flowers and chocolates, while some get a monument - some women have all the luck) has been converted into a museum. By the time we stumbled out of the Red Fort grounds we were dying of thirst and hunger and a little bleary eyed from the autumn sun. My sister suggested jal-jeera from one of the hawkers outside the gate. Paranoid of catching something awful like cholera or something, I considered refusing. But hey, you can't experience old Delhi without getting with it. So I “got with it”, and my god, I downed a glass of sheer ‘wow-that-was-refreshing’! And then we rode a rickshaw! Delhi's rickshaws are something to write home about. The yesteryear charm of the whole thing notwithstanding, there is something about it that demarcates the social classes. In Delhi, men stare and how. But while you shouldn't let down your guard, I would advice not caring too much about the staring. Besides, we had other fish to fry, for we were headed for the Jama Masjid - that sprawling example of Mughal architecture, which is believed to be Shahjahan's last gift to Delhi. You'll need to leave your shoes behind and if you're a woman and you're wearing jeans or shorts or anything remotely figure-hugging, be prepared to be given the most hilarious of wraps to wear around you. The wrap is of questionable cleanliness, but again, in Delhi one must get with it. Jama Masjid is worth it all. The words beautiful, splendid, magnificent all fall with a dull, empty echo at the 30-step stairway leading to this mosque. I had to shell out 200 bucks to carry my camera inside. But it was money worth spent. Tourists aren't allowed inside during prayer hours, but the place is open all days of the week. There are places of worship and there are places of prayer. Places of worship have religion written all over it, while the latter has the soft footfall of a divine presence. Jama Masjid, despite all the noise around is a place of prayer. Never mind the disdainful glares you might get, but each photograph stirs a pleasant nostalgia, even after all this time. Next we needed lunch. We'd landed in a Delhi that was in the throes of pre-Diwali rush. The good thing about that was that everything was decorated and beautiful. The not-so-good side was that old Delhi was a coagulation of slow moving human mass. Chandini Chowk was a blur of rush along lest we lost sight of each other in the crowd. We tried to get to Parathagalli as soon as possible, rushed by a growling stomach. But Parathagalli, a small alley that one could easily miss was teeming with people. After a rushed and disappointing lunch of parathas and a tall glass of Lassi, we rushed to next thing on our itinerary. Shopping. Delhi is famous for budget shopping. Delhites have no excuse for not being fashionable. The latest trends, the hottest cuts, the season’s colours - the streets of Delhi is the budget fashionista’s dream come true. Bargain like you invented it. And that’s what we did and we shopped so much that we had an excess baggage situation. Sarojini Market, Lajpat, Janpath - some of the places where we got the best deals. Be prepared to spend a good few hours, hunting and bargaining and then trying your best to believe your luck. One can really get a little carried away with all the amazing prices. And carried away did we get. All the while, taking in more of Delhi at Diwali. 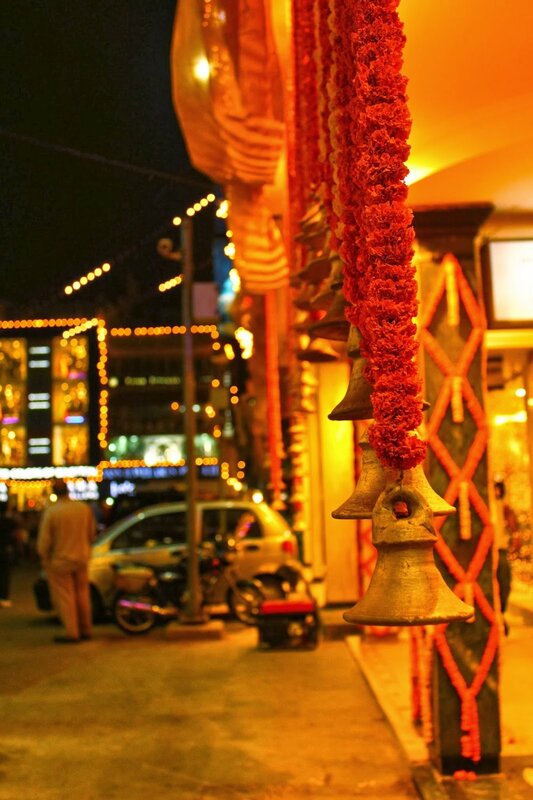 Marigold garland decked shop thresholds, the smell of sugar and the sizzle of ghee hung thick, melding in with the Delhi smog to create a sticky, sweet air of expectation. Lights blinked in ant-lines across parking lots, gift-wrapping rustled with delicious suspense, storefronts were decked up and we saw the city with festively orange-tinted glasses. Three days went by in a flurry of metro rides, ghee-soaked sweets, street shopping, trysts with history, autorickshaw rides past sprawling mansions that distinctly enunciated old-money, tree-lined aristocratic neighbourhoods, crumbling yet breathtaking edifices from an another time. The sights that Delhi takes for granted is almost unfair. The city touches you in a way, that it leaves a soft dent where it touched you. Ancient minarets rising against the horizon; random men seeking solace in the act of feeding pigeons on bridges, roadsides, parks; the unpretentious cycle-rickshaw wallah, the bareness of their hard existence written plainly on their gaunt knuckles and cheeks; the forts, the tombs, the imperial gates that once were the thoroughfare of royalty. And the food!! Oh my goodness, what food. The portions are generous and the flavours are incredible. Of the many firsts I experienced in Delhi, polishing off half a kilo of gulab jamuns in one go, stands out. Albeit a tad anatomically to get literal to count the kilos I put on..but hey, one must get with the programme. When in Delhi, forget the waistline and dive into those gulab jamuns and barfis and pedas and jelebis and laddoos. I had seen much, though not enough, of Delhi and before I knew it, four days had flown. But I had to visit the Purana Qila. The name called out to me, with haunting strains for ages. Old Fort. The oldest fort in Delhi - the oldest structure. What memories this silent spectre of sandstone must have, what testimonies it would bear. It was built by Sher Shah Suri on the site that was believed to have been where the legendary Indraprastha was located. It was completed by Humayun later. We walked in through the Bara Darwaza or the big gate - an imposing structure that was made to intimidate - it was as bara as bara could be! The deserted premises was filled with an eerie quiet. In the wide complex that despite its apparent majesty was considered unlucky for rulers, we headed to the Qila-i Kuhna Mosque - a well-preserved remnant from the pre-Mugal era. A beautiful building with haunting echoes of many a prayer, we spent a long time in quiet contemplation - the silence broken only by the whirring of my camera. Witness to countless bloody affairs, in the most recent times, Purana Qila was used as a refugee campsite for Muslims migrating to Pakistan during the Partition. Rulers who ruled from the Purana Qila didn’t rule for very long - it’s believed to have been jinxed that way. The buildings within the complex had a very detached air about them - they stood like they belonged to no one and made no attempt to fraternise as opposed to the Red Fort palaces that cozied up to one another. They stand distinct and resolute and on a hot summer day, this probably won’t be one of the best touristy things to do. But this was an autumn morning and the crisp mellow sunshine bathed the ochres and the reds and the browns of the monuments in a delicious, vintage photo haze. Inside the fort, we had a bunch of dog escorts accompanying us everywhere we went. 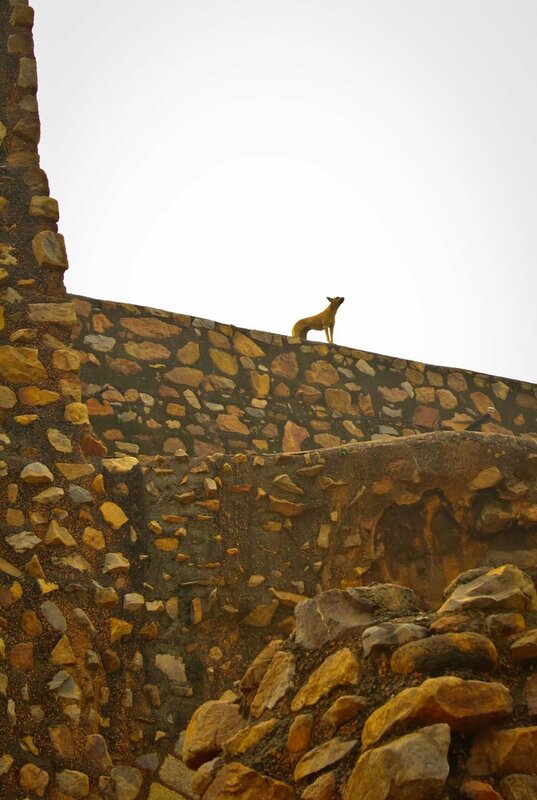 As we headed to the southern ramparts of the Humayun Gate, some of them, as if on cue, took up sentry positions. Reinstating my belief that Delhi is filled with ghosts that will never ever leave it. Ghosts that will stand silently in the corridors and crumbling parapets and eaves of their palaces. And then suddenly take flight with the sound of unoiled hinges, startling you and catching you unawares. Reminding us, that we’re in the presence of greatness and to conduct ourselves accordingly. Reminding us, lest we forget.